The annual AARP envelope made its way to the junk mail pile and then the trash this week. Every year it is a reminder I am not getting any younger. 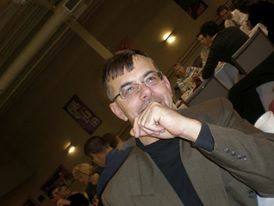 Another birthday … this one met with many challenges with my full-time job. The annual benefit open enrollment season underway, the wellness program deadline, flooding work conditions with the construction issues, and office politics escalating into a scandalous FBI investigation are more than I want to handle. It’s my birthday week, dog-gone-it! Can’t a 53-year woman have some peace and celebrate a day? We have at least one pair of Eastern bluebirds who have nested near the fields at Boone Hollow Farm. Wooden bluebird houses are attached to a few nearby fence posts. Natural foliage and virtually undisturbed grounds surround. They fly freely during the day, flitting about gathering bugs to feed their young while singing beautiful songs. Their predators such the night owl and coyote are heard every night. Yet each day is an occasion for song despite the possible dangers that lurk. Wildlife and nature live in the present moment, and celebrate it. This is what my grandchildren remind me with their everyday lives. They find simple joy in drawing with colors on a blank canvas of recycled paper, creating a sweet note to mommy or me, and the innocent truth they speak even in those awkward moments. Living life to its fullness. Children welcome the gift of living in this present moment, which can bring their adults to this same place, if we allow it. My husband, Dean does this for me as well. I am a planner, and he lives for today. So sociable, affectionate, and thoughtful. Dean brings me back to celebrate this moment. Praying, journaling, and gardening take the cares of yesterday and worries of tomorrow so I can celebrate today. 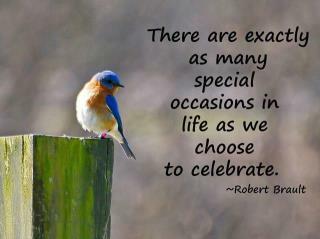 “There are exactly how many special occasions in life as we care to celebrate,” this Robert Brault quote says. Simple joy for the taking, everyday.